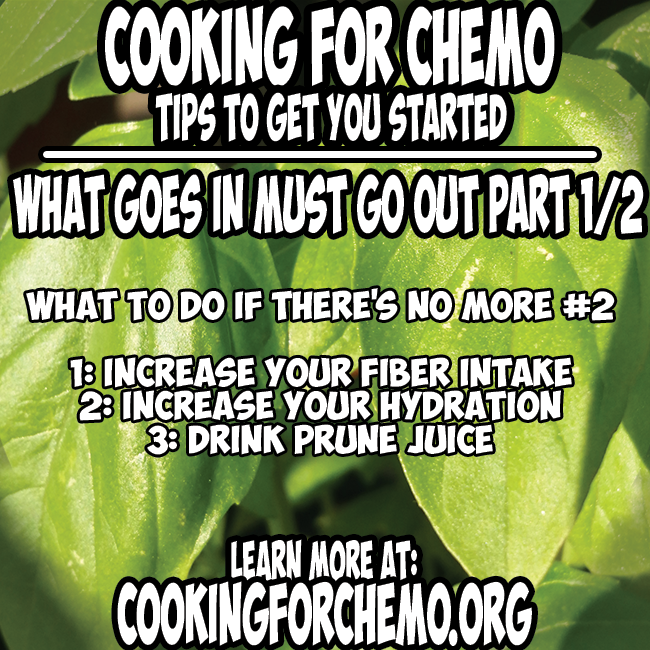 Welcome to Cooking for Chemo for Beginners! Beginners start here! 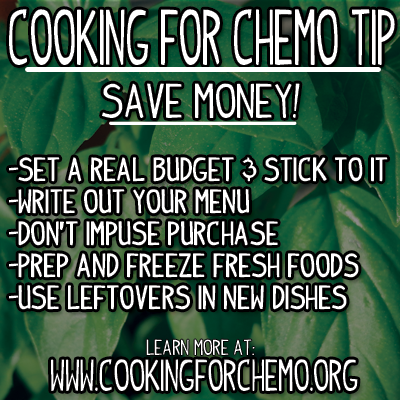 This is the place to start if you have just discovered Cooking for Chemo, have recently been diagnosed with cancer, beginning chemotherapy treatment, in the midst of chemotherapy, or are a caregiver for someone that has recently been diagnosed with cancer or in chemotherapy. 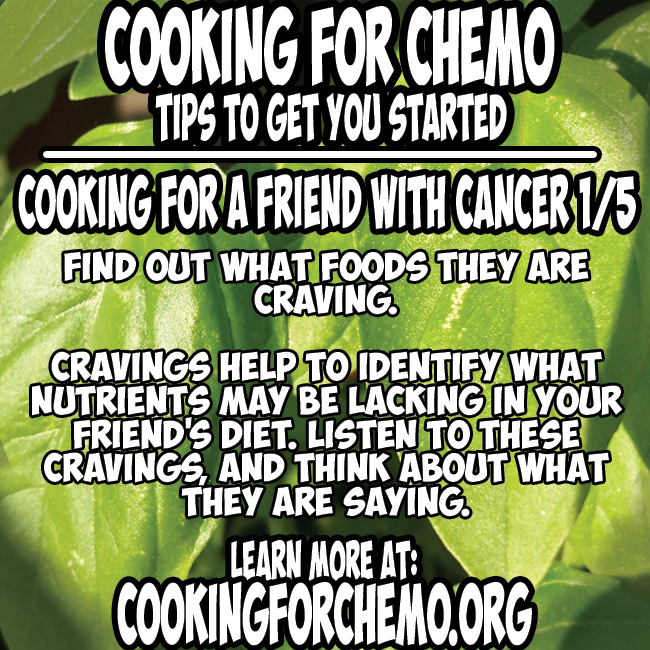 Our website is a great cooking resource that gives you helpful cooking and eating tips, tricks, healthy recipes, and easy recipes to help you begin learning how to cook for cancer patients going through chemotherapy. 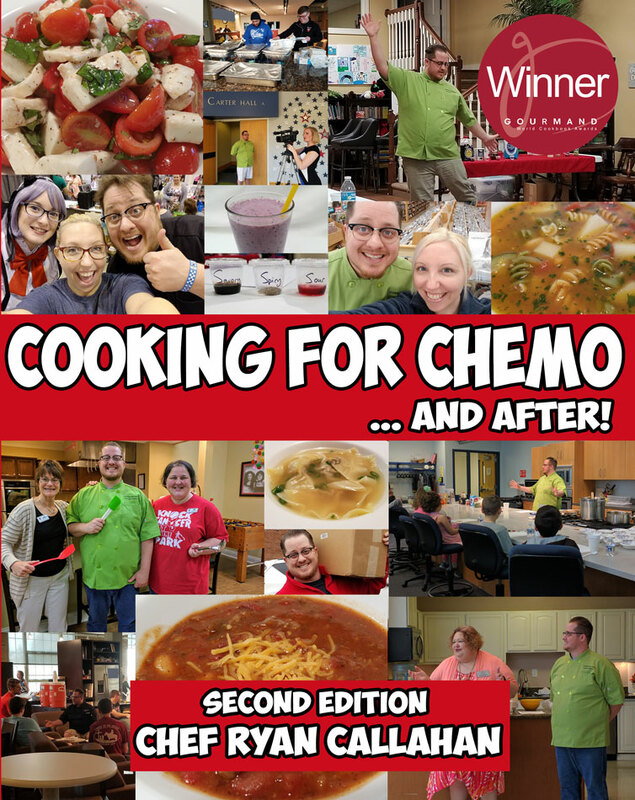 For a more in-depth discussion, you can read Chef Ryan Callahan’s cancer cookbook, “Cooking for Chemo …and After!” Our cookbook is available on Amazon. 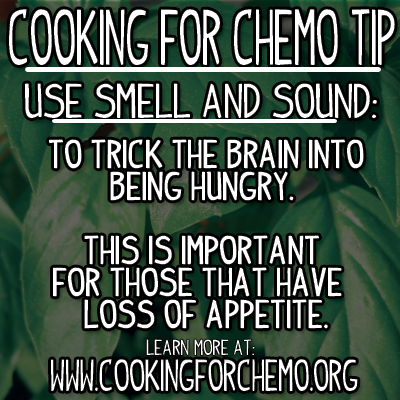 This article gives you a chef’s overview of the Cooking for Chemo basics, such as Roundness of Flavor and Palate Cleansing. What is Roundness of Flavor? 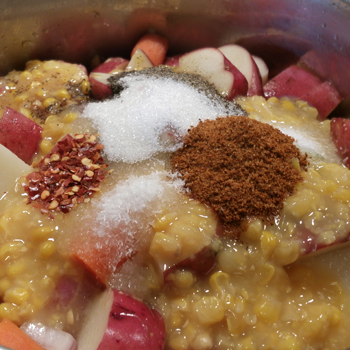 This article explains what Roundness of Flavor is and how to begin thinking about all 5 senses, like a chef does, when cooking for someone going through cancer treatment. 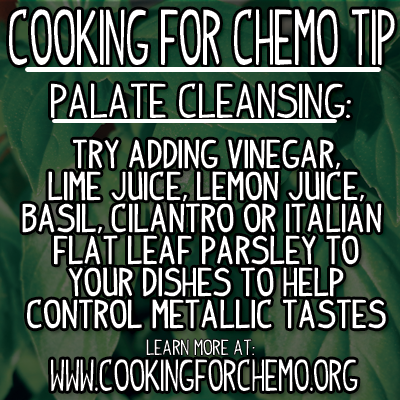 An ever present metallic taste can stop you or or loved one from being able to eat during cancer treatments. 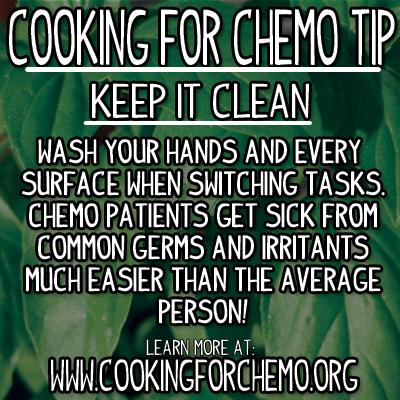 This article will help you begin to adjust your cooking to help combat this chemotherapy side effect. Learning how to use your different senses to your advantage can help you to regain your appetite and train your body to know when it is time to eat. This article will help you get started on learning how to regain your appetite. 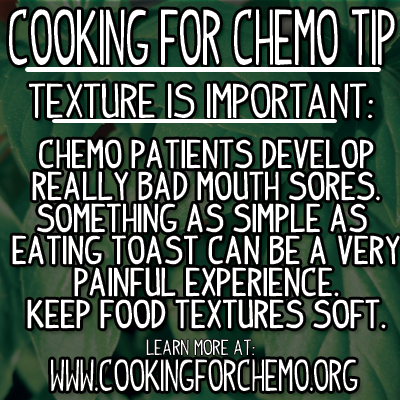 Being aware of the different textures and spices that will irritate your mouth sores when eating during chemotherapy is extremely important, but often overlooked. 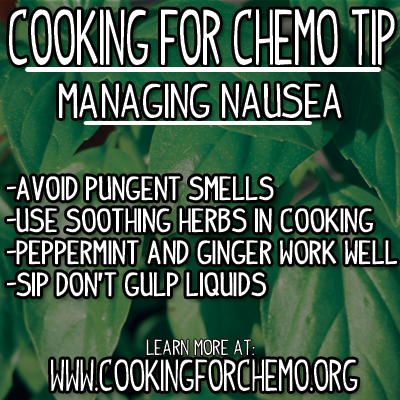 This article will teach you what you need to be aware of when cooking for yourself or someone who is having difficulty with mouth sores during cancer treatment. Learning and re-learning about different smells, cooking and non cooking related, needs to be a priority. Smell affects your appetite faster than any other sense. This article will help you narrow down what smells help or harm your appetite. Learning to manage nausea is an important step in regaining your appetite. These techniques, as well as the article on Smell and Chemotherapy, will help you get your nausea in check. 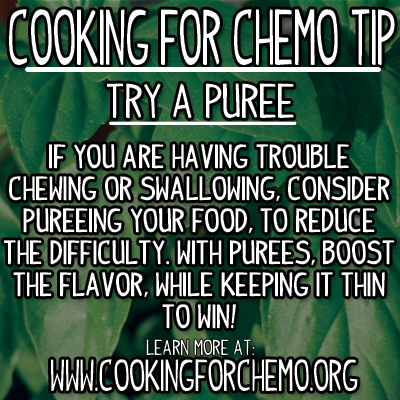 Some people have cancer and cancer treatments that severely affect their ability to produce saliva, chew, and swallow. This article will give you cooking techniques that will help you or your loved one that is struggling in this specific area. Kids are picky and cancer treatments can make it even more complicated to feed your child. 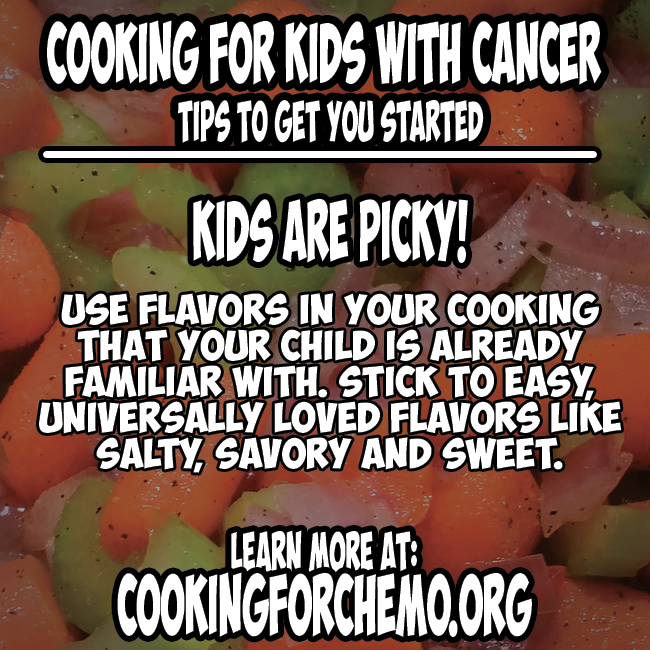 This article gives you a starting point to help your child eat during cancer treatments. 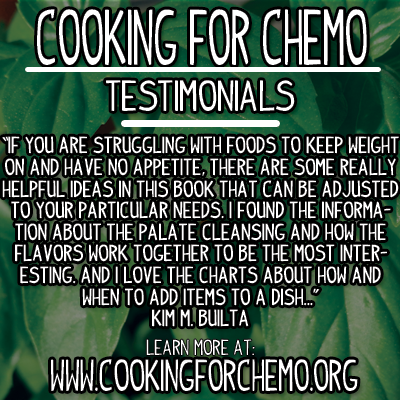 Wanting to cook for your friend or family member that is going through cancer treatments is great! However, there is some information that you must know before you take your loved one a casserole. This article will teach you the information you need to know before you get started cooking for your friend or loved one. Saving money on at the grocery store is hard when you don’t have cancer. But when you have the added expense of cancer, it is even more important to pay attention to how much you are spending on groceries. This article will give you some practical tips to help you save money when it comes to purchasing food. Don’t let going through cancer treatments take away your ability to enjoy the holidays! 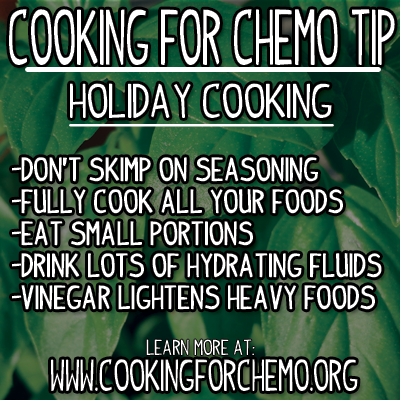 This article highlights different things that you need to be aware of when cooking for yourself or a loved one that is going through cancer treatments during the holiday season. One area I have found almost every home kitchen to be lacking in is a proper approach to sanitation and cleanliness. Under normal circumstances, this would be more of a trivial matter. But when our loved one is fighting cancer, these treatments often suppress their immune systems, making something as simple as mild food poisoning an emergency room worthy offense. Learn some easy and basic sanitation tips that will keep your loved one from getting sick. As the old saying goes, “what goes up, must come down.” The same is true for eating, “what goes in, must come out.” Normally, your body simply takes care of everything automatically. But if you are going too much or going to little, it becomes quite the problem. I am going to give you some real world advice on these two common problems, address their causes, and offer you some helpful solutions that will hopefully enable you to rectify the situation quickly.